I’m afraid of heights. I’m not sure I always have been, but there have been a number of times when the adrenaline that rushed in, with my awareness that I was in a really high place, was more than I could handle. The heights that have scared me have been both literal and figurative. I have often been afraid to take jumps. Jumps to different phases of life…jumps into the arms of people begging me to trust them..jumps into uncertainty. Anyone who has watched my life for any amount of time may be surprised to hear how reluctant I have been to make the leaps I have. To an outside observer it may seem like I have had no issue diving into marriage, into motherhood, into moving houses too many times, and into any of the job choices I have made. But don’t let appearances fool you. The weekend before I got married, I went hiking with my younger brother in Colorado. 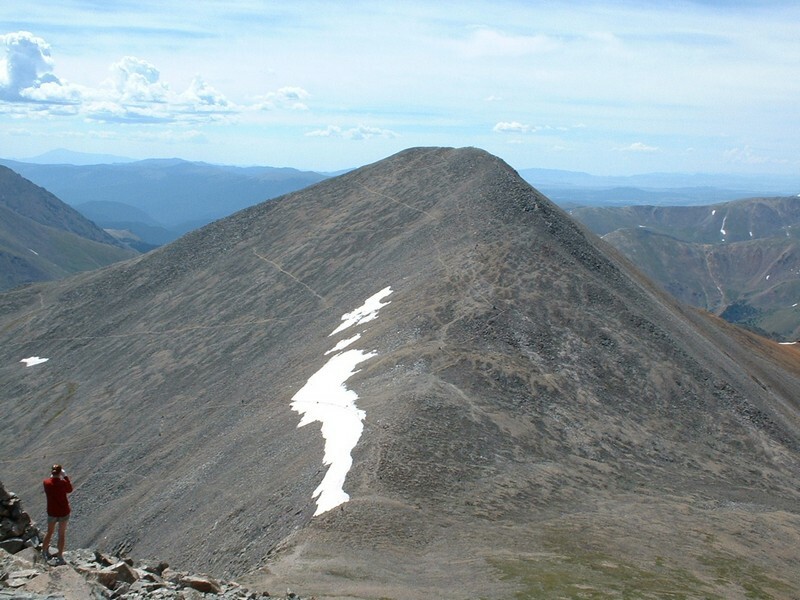 We had decided to scale two fourteeners in one day. For those of you not familiar with the mountain term, it refers to mountains that are over 14,000 feet tall. 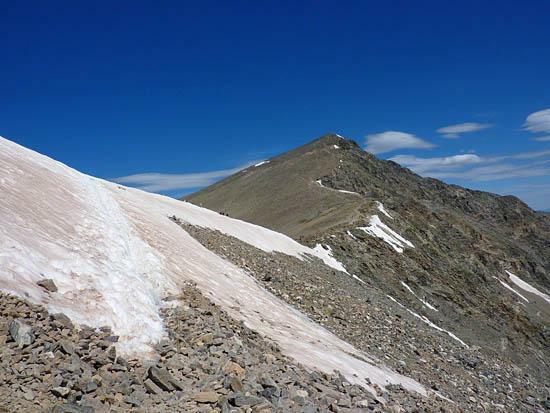 The mountains we chose were Grays and Torreys Peaks. They are heavily traveled trails and good for beginners like me. The day was beautiful, the company fantastic, and staying on a groomed trail was not much of an issue for me. We summited the first peak, traversed the trail between the two and summited the second peak just before the afternoon thunderstorms started to roll in. Standing on the top of the second peak, my brother and I realized that we were going to have to make a decision. It was unlikely we would have time to get back up the first peak and down safely before the lightning threatened, and as every Colorado hiker knows, when you are on the top of those mountains you have nowhere to hide from the electricity buzzing above you. So we made a choice to take the shortcut between the two peaks and across a narrow, snowy path. We could see hikers ahead of us, and from a distance it did not look like something that was going to be that difficult. It was only when I got to the middle of that section of the path that I made the mistake of glancing down the mountain to my left. Panic rose in my throat when I became keenly aware of how dangerously steep this section of the mountain was. There was maybe ten feet of snow between me and a quick and fatal ride to the bottom. I froze. My breathing shortened and I could not coax my legs to move me anymore. My brother tried to console me. He is an avid mountain-climber and he had more confidence in me than I did. I was not very reassured, and my brother and I stood paralyzed by my fear. A couple of the hikers who were further along this section of the shortcut heard my panic. They came back toward us, and one calmly put out his hands for me to walk with him the rest of the way. He walked backwards and I clung to him walking forward. I did everything I could to ignore my weak and wobbly legs. It has been a while since I thought about that day. I think I’ve just figured something out. I think, maybe, I wasn’t just afraid of my physical surroundings as we hiked. I was afraid of the leap I was getting ready to take into the next phase of my life. I think a part of me knew that uncertainty, the threat of storms, dangerous drop-offs, slippery slopes, spontaneous decisions, paralyzing fear, and exhilirating triumph were all a part of the adventure of marriage. If I didn’t subconciously know that then…I do know that now. Marriage is a lot like the hike I took nearly thirteen years ago. There are peaks, there are valleys and there are snow fields we sometimes have to cross that may not have been a part of the plan. My husband and I are standing on that second peak. We’ve been there for some time now. The thing is, we can see a storm coming, and we can no longer stay where we are. It’s time to get down, to move on to something else, but I can really only see one way out. We are going to have to cross that figurative snowfield, and we are going to have to do it with faith that it will all turn out okay on the other side. This time I know there is help out ahead of us. I believe it is God who is gently coaxing us onto the snow. I’m not panicked, just intrigued, and my knees have stopped shaking. I am calmer as I look out on the next leap I have to take…and this time, my husband and I will be taking it together. I know the shaky leg feeling. Thinking of it now, you’ve inspired me to write about it soon. And I love the comparison to this and marriage. I wish you and your hubs the best if whatever lies in front of you. Thank you so much. It does feel better to stand more sure-footed. The peace that has enveloped me since that shaky climb is much more than a physical steadiness. I am ready for what is to come. Gorgeous! The photos and the writing. What a lovely metaphor. I am glad you’ve had strong partners to help you along the way, and that you’ve been open to asking for help. I wish you luck on the next phase of your journey. Wonderful read. I know exactly where you were hiking with your brother…and I’ve also had to stand looking at those figurative snow fields in marriage. The leaps…those scary passageways in life, are what make us stronger. 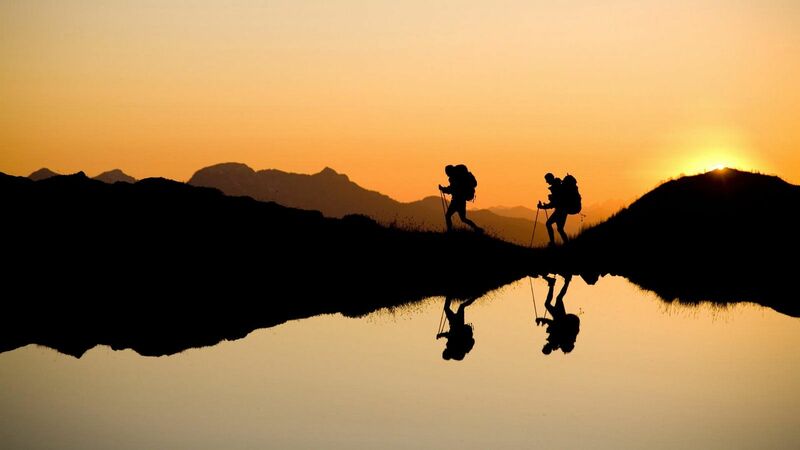 Like your successful return from your hikes with your brother…you will survive whatever is up ahead. I wish you a safe landing whatever is ahead! Thanks Annie! Cool that you’ve been to the hike I describe. I am confident we’ll be fine, but like a scary movie…it is still adrenilin-forcing. All part of the experience I guess though, huh! Age and experience are wonderful “hand holders” to help us get across whatever snowy peaks we have to cross, but your comment about knowing God is the one doing the coaxing is, most likely, the one that will see you safely to the other side 🙂 I enjoyed the comparison between your experience and marriage as well. As always, a great post. Have you ever listened to the song “Iceland” by Mary Chapin Carpenter (album The Age of Miracles)? Your might like it! Your post reminded me of it…. Beautiful post with wonderful analogies. Thanks for sharing, I know the Lord will keep you strong as you step into the next phase of your life together and in His purposes. Very nice post! I love how you compared your fear of heights to fear of taking leaps in other areas of life. I too am afraid of heights. I recall being on a ski lift in Lake Tahoe with my husband, who found out at that exact time I was scared of heights. Not the best time for him to learn that. But he stuck around!